An easy to use, affordable all-grain system that ships free and is the only cooler system to include built in thermometers.Thermometers are tricky to install in coolers but they make them so much nicer to use. 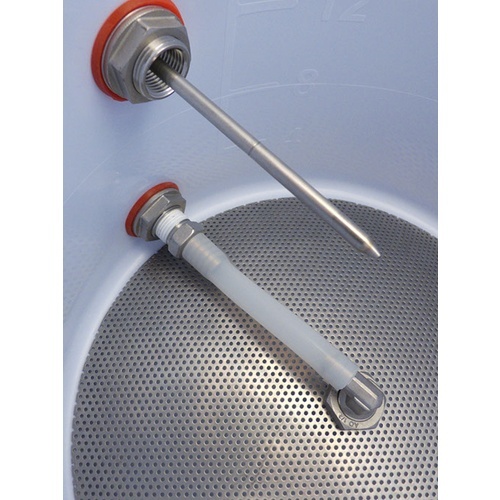 We include only the highest quality components in the industy.This is a completely pre-assembled set up that includes a mashtun and hot-liquor tank. 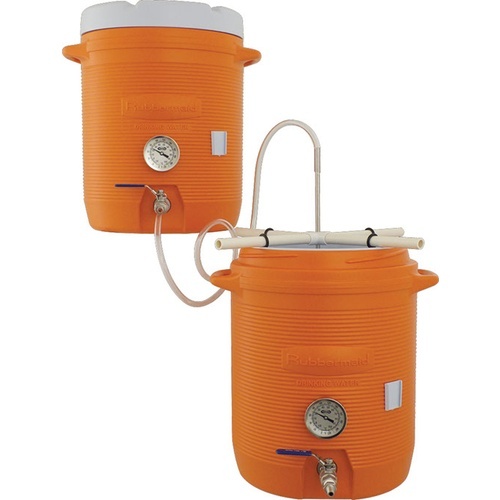 All you need a is an 8 gallon (for 5 gallon batches) or 15 gallon (for 5-10 gallon batches) boil kettle! The coolers do an amazing job of retaining heat. 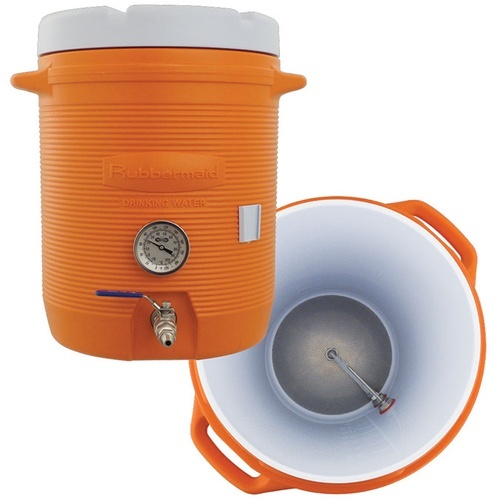 You'll notice barely any temperature loss throughout your 1hr+ mash and sparge. 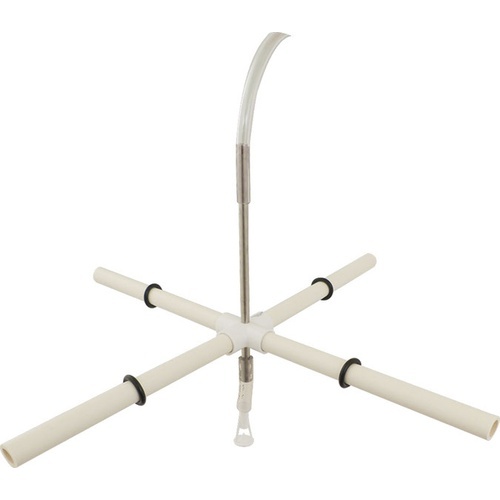 We use high quality components - Rubbermaid coolers which cost more than Igloo or imported versions from China, all stainless steel hardware and FDA approved silicone tubing that is heat resistant to 500 degree. How Much Grain Can I fit... Lots! Son asked for Christmas present to make home all grain beer. Nice setup but did have to file down the edges of the false bottom. Also both valves leaked. Had to disassemble and remove plastic burrs and reassemble. After that very satisfied. Stepped up to all grain after several years of extract brewing. I looked at a lot of other mash tuns and HLTs and decided on this combo. Darn glad I did! It was the best bang for buck and performed flawlessly! Held the right temp steady for an hour. Never going back to extract! Would be better if the false bottom had a clean edge so I don't feel like I am scratching the plastic every time I moved it. Expensive but not as expensive as going stainless... works very well for me! You can build these for less, it's true but I chose to go this route. All of the hardware is top notch stainless steel. The sparge assembly works well, false bottom is top quality. The coolers do warp, they are coolers after all. I did my first batch in these and it came out great. Coolers hold temperature very well for a full 1 hour mash. More consideration needs to be given to your strike water temp as you will lose temp at the beginning of the initial mash with no easy way to reheat. I found it easy using calculators found in brewing software. This is truly a great option in lieu of spending the money to go all stainless. Highly recommended these to anyone interested. I purchased this all-grain system from Morebeer's Concord retail location. After doing some good (not great) extract beers I really wanted to try all-grain brewing. I've used this system on 5 batches I've made and WOW! it's a game changer! The thermostats on the face of the coolers really helps to see if I hit my temperatures on my mash and it holds the temperature really well and having the ability to fly sparge is awesome! The only reason i'm giving a 4 star and not 5 is because after the 3rd brew, the inside of the mash tun and HLT are warped.